This years conference returned the Midland Hotel in Bradford. Delegates came from as far and wide as USA, Greece, Norway, Ireland, Spain and Austria. The first day of presentations and discussions was followed by a banquet. Day two was a tour of a number of sites which process wool from the point at which it arrives from the farm to scouring, spinning, dyeing and making the finished product – a carpet. The trip took all day around the Bradford area and was aptly named “The Fleece to Floor Tour”. 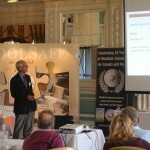 WoolSafe conferences are closed to members and invited guests only, but if anyone is serious in the wool carpet care business they should be attending. I will definitely be attending the next one! !